UNPO: West Papua: Like East Timor Just Before Independence? West Papua: Like East Timor Just Before Independence? 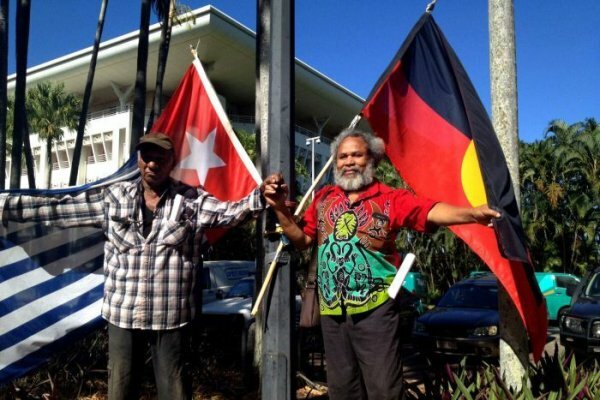 Protests for West Papuan Independence from Indonesia took place outside the Parliament House in Darwin, Australia. Comparing the current situation in West Papua to that of East Timor just before its independence, the protesters urged the international community to intervene and provide support for their deteriorating situation. The situation in the Indonesian province of West Papua is similar to East Timor just before independence, a West Papuan activist has announced at a protest in Darwin. A group of about 60 people have erected a temporary hut embassy outside Parliament House, calling for West Papuan independence from Indonesia. Jacob Rumbiak, who said he was now in self-imposed exile after spending 10 years as a political prisoner, said the situation in West Papua had worsened recently. "In April, Indonesia caught 447 of the student movement," he said. "Last month [June 2015], after Indonesian president [Joko Widodo] released five political prisoners, they caught another 500 of the student movement. "Also, they killed three people, including one secondary student." A Darwin Aboriginal elder taking part in the protest said Indigenous people there are being subjected to rights abuses. Larrakia woman June Mills said the hut embassy was about giving a voice to the voiceless and she called on governments around the world to intervene in the West Papua situation. "We have laws in this country that protect indigenous rights and children's rights ... if the Government isn't going to stand up and do the right thing, well the people of Australia are going to," Ms Mills said.